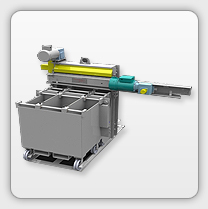 Model 3000 Hopper Feeders for Centerless Grinders can handle a wide range of part sizes and shapes that require O.D. grinding. These Feedalls can be designed to use dump stands, dumpers and metering hoppers to add capacity and auto load your centerless grinder making loading no problem. Model 3000 with Detachable Base — Flexibility in design allows Feedall to provide a detachable base that can be off-loaded from a previous operation and auto loaded to your Feedall. Feeds aluminum tubes, 2-3″ dia. by 12-20″ long from floor hopper, loaded with bundle gripper in bundles of 60-150 tubes. Tubes are elevated and discharged to a magazine then escaped one at a time to cross conveyor and fed to friction welder. Fees steering racks from an automatic or random loaded, floor mounted hopper. The steering racks are then elevated from the hopper and discharged rolling into an accumulation chute, where they are be escaped one at a time onto a rear mounted, cross-feed conveyor. The conveyor transfers the parts in a continuous stream to the workrest of a Cincinnati Model 340-20 DE centerless grinder, then a Model 1650 conveyor transfers the parts between two Cincinnati Model 340-20 DE centerless grinders. Then the next Model 1650 conveyor transfers the parts from a Cincinnati Model 340-20 DE centerless grinder onto a collection ramp. Feeds piston rods from a manually loaded, floor mounted magazine. The rods are fed in a continuous stream and escaped one at a time rolling onto a front mounted, cross-feed conveyor. The conveyor translates parts in a continuous stream to a Model 350-20 AE centerless grinder. Feeds steel bars from a manually loaded floor mounted hopper. The bars are elevated from the hopper via cleated belt and deposited onto a front mounted cross-feed conveyor. The conveyor translates the parts in a continuous, end-to-end stream to the workrest of a centerless grinder. Feeds agitator shafts from a random loaded, floor mounted hopper. The shafts are elevated from the hopper via a cleated belt and deposited onto a rear mounted accumulation ramp. An air operated escapement device loads one part at a time onto a cross-feed conveyor, which translatse the parts in a continuous, end-to-end stream to the workrest of a centerless grinder. Feeds crosshead pins from a manually loaded, single row magazine. Pins are escaped, one row at a time, onto cross-feed conveyor and conveyed to the workrest of a Cincinnati Model 360-20 DE Centerless Grinder. Conveys crosshead pins from the workrest of a CINCINNATI Model 360-20 DE Centerless Grinder to a cam-off device into an adjustable accumulation tray.